This week, students fight for racial justice from Texas to Binghamton. The 2013 National Student Power Convergence is in the works. And Colorado students walk out on standardized tests while Indianans prep for a massive university strike. E-mail questions, tips or proposals to studentmovement@thenation.com. For recent dispatches, check out posts from January 18, February 1, February 15, March 1 and March 15. A second mass assembly for the Indiana University strike convened on March 21. Graduate students, along with instructors involved in the Progressive Faculty and Staff Caucus, are organizing interdisciplinary and unconventional learning activities for a Free University at the Woodburn Hall and Showalter Fountain Strike Center, intended to be an open occupation throughout the strike. Though the strike movement has made a serious attempt to reach out to campus workers and staff, the fear of administrative reprisal and possible termination has kept many from participating. On April 9, there will be a mass assembly to organize pickets, the 10th a concert in Dunn Meadow, and on the 11th and 12th, the strike. Over the past few weeks, we, the students in Colorado, have been holding citywide meetings to discuss our education and what needs to improve. One thing that we all agreed needs to change is our curriculum. Over the past few years, our schools have had to teach to one test, the Transitional Colorado Assessment Program, and some of our schools have closed due to low-test scores. We want an education where our schools have the goal to teach to the whole child. We want to show our state legislature, the media and the citizens of Colorado our demand to be part of the conversation to change our schools. To do this, we made a public stance in front of the capitol: forty students from eight different schools walked out on the last day of testing to show that we believe these tests are not preparing us for the real world. This weekend, students from across the state of Colorado had a retreat to figure out what to do next to improve our education. On March 21, more than 80 teen voting volunteers strutted our way to the capitol to declare Arizona Voting Rights Protection Day. Determined for a response, we lobbied 20 legislators to vote against unjust elections bills, SB 1261 and SB 1003, that could potentially suppress the Latino vote and classify all the hard work we did to pick up ballots as a class 6 felony. We were ecstatic to get our point across to our legislators and see that our efforts are being noticed. One of us, Andres, got the opportunity to speak with a representative we met last year, Jonathan Larkin. Andres shared his opinion of the bills and his personal story about fighting for his family. Lobbying our legislators helped us feel our power. We won’t stop building our communities, and now, it’s easier because we know more people are standing with us. In August 2012, 300 student leaders from twenty-seven states converged in Columbus, Ohio. We spent three days learning about each other as organizers, as representatives of our geographic spaces and respective issues and as humans. We were inspired by the stories of international student movements. We left with a renewed sense of what a cohesive, intersectional movement should look and feel like. This year we are excited to bring together the success stories of the last year, and many others, at the 2013 National Student Power Convergence. We aim to craft an even stronger story of the youth movement, through panels, trainings, workshops and general assemblies. The entire agenda will be constructed by student organizers to highlight best practices and tangible wins. We want to build off the theme of intersectionality from last year by learning from the wins shared by multiple issues. We want people to leave with a comprehensive political and tactical analysis, replicable campaigns and the energy to propel us through 2013, and beyond. In the United States, 1,000 young people ages 13 to 24 acquire HIV each month, and 60 percent of those who have the virus don’t even know it. To end this epidemic, I have become an ambassador for the first National Youth HIV & AIDS Awareness Day on April 10, which includes events in high schools, colleges, churches and community centers around the country. The drive behind my work with HIV & AIDS comes from a very personal place: My uncle was diagnosed with HIV in 1986. Back then, there was not nearly enough education about, awareness of, or proper treatment for this disease. Other young people like me are also working to educate their peers, stand up to school boards and bring truth to bear on the myths. For us, HIV is a disease that can easily be prevented with the right education, awareness and community resources. In 2012, after concerted pushback from parent groups, educators and their supporters, the Florida Senate shot down Florida’s "parent trigger" bill. The bill is back again this year under the misleading title of "Parent Empowerment in Education," and its reintroduction has, once again, ignited protests from parent groups and educators. The Florida chapters of Students United for Public Education at Florida International University and Florida Atlantic University have been organizing and raising awareness around the pitfalls of parent trigger legislation, standing in solidarity with the Florida PTA, NAACP, LULAC, educators and other parent groups who oppose the bill. The Florida SUPE chapters have started a petition to raise their voices to Florida legislators. While the chapters are just a semester old, they are establishing a university presence by actively promoting support of public education and educational equity to the university community and by networking with other social justice groups. On April 1, 2011, the PT Kizone factory in Indonesia was shut down, and its workers receieved none of their legally mandated severance pay. Nike, Adidas and the Dallas Cowboys had contracts with the factory, and together owed the workers $3.3 million in pay. Adidas is the only one that hasn’t paid—leaving workers $1.8 million short. As part of a national United Students Against Sweatshops campaign, Penn State USAS has had a number of actions, vigils and banner drops to gain attention and educate students on the horrifying facts of Adidas’s negligence. After a number of meetings with other administrators, President Rodney Erickson finally agreed to meet with students. Fifteen days later, he made the choice to cut Adidas’s contract temporarily—and, if the company doesn’t pay the workers their severance pay within 60 days, not renew it. As the United States Supreme Court considers the Fisher v. University of Texas affirmative action case, Students for Equity and Diversity at the University of Texas at Austin has been organizing for the preservation of equal opportunity. SED’s work has focused on empowering the student body and informing the national media about UT students’ support for holistic admissions (the narrowly tailored affirmative action policy that UT uses). We have conducted teach-ins and forums with attorneys from legal defense funds. About 500 students attended our last event, where civil rights attorneys from New York City and San Antonio discussed the case and how students can mobilize around it. As we await a decision, SED will be preparing students to shape the conversation on equal opportunity in any outcome. We will be having a stakeholder meeting soon with campus leaders to discuss the various ruling possibilities. On March 6, students and several campus groups at Binghamton University organized a Confronting Racism Forum, followed by a rally and teach-in on March 13. These events were triggered by students' frustration with enduring racism and the lack of diversity on campus. The forum was designed in the tradition of 19th-century slave narratives and drew more than 100 attendees. Students were asked to step forward and share racist events they had experienced, and to make connections between these overt forms of racism and the institutional ones that they reinforce. A week later, as many as 130 students rallied to announce that they would no longer tolerate any form of injustice and to demand that more be done to increase the presence of people of color at the university. The main purpose of these two events was to reintroduce students, especially the black, Latino and African students on campus, to a culture of activism. Florida's youth are under attack, whether in matters of national tragedy like the murders of Trayvon Martin and Jordan Davis, or the thousands of youth that are ripped from their families and schools and thrown into jail. The Dream Defenders have developed a SNCC-like statewide network of black, brown and allied youth and students for legislative fights and building real power in their communities. With the Civil Rights movement as both model and compass, youth are confronting voter suppression, the prison-industrial complex and immigration through relational organizing and training, civil disobedience and direct action. 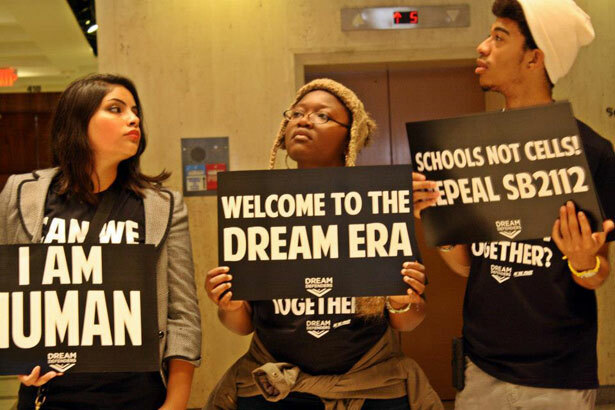 The Dream Defenders took over Florida's capitol on the first day of the legislative session to announce a Dream Agenda and let legislators know that youth will be silent no more. This week, they will join organizations nationwide in the National Youth of Color Action Week, calling on legislators to end the era of incarceration over education.